In a world first, this new SIMU central motor features an in-built radio receiver that can be controlled remotely from a SIMU Hz radio transmitter. Ideal for the motorisation of metal grilles and commercial shutters, this product innovation will mean faster installation with no wiring required for control boxes or external receivers. Easier limit settings are also a feature of the new SIMU CENTRIS Hz with the settings being set from your SIMU Hz radio transmitter, eliminating the need to access the motor during limit setting. The new SIMU CENTRIS Hz will be available in 2 powerful torques of 100Nm & 140Nm from early November 2013. Call (08) 8341 0120 for more info. CW is pleased to introduce you to Mr Lindsay Jacks, our newest team member. Lindsay has recently been appointed to the role of Business Development and Account Manager for New South Wales. Lindsay has a wealth of industry experience and knowledge coming from a proven background in the window furnishings industry. Like the rest of the CW Products team, Lindsay is passionate about delivering high levels of customer service and hopes to build on CW Products' existing business relationships with suppliers and customers. He is currently in the process of introducing himself to our NSW clients. In the meantime, if you need any assistance or information please do not hesitate to contact Lindsay on his mobile 0421 559 942 or by email l.jacks@cwproducts.com.au. SIMU has just launched its all NEW Color+ range of Wireless Wall Transmitters and hand held Remote Controls (both 1 channel and 5 channel remote control options available). Featuring architectural, modern designs with straight, flat lines, these remote controls and transmitters have a timeless and universal appeal. Available in 6 modern and attractive colours, these remotes and transmitters will be in stock and available for order from the end of July 2013. For more information, simply request an updated SIMU Hz Remote Controls Fact Sheet or speak to your local CW Products representative. Call us on (08) 8341 0120 for more information. We are pleased to announce the commissioning of our NEW state-of-the-art Swiss-Made Pelmet Bending Machine. This high productivity, precision bending line ensures that all new CW Products Roller Shutter Pelmets are being made with the highest precision and are of exceptional production quality. These new and improved pelmets are now flowing through to our customers. For more info on our high quality range of Roller Shutter Pelmets, please call your local CW Products representative (08) 8341 0120. The hugely successful SolarSmart™ Roller Shutter Automisation system is now available for Ziptrak® blinds! It works by harnessing the sun's energy through solar panels positioned on the blind pelmet or near the blind. This charges a concealed battery that powers the motor. SolarSmart™ offers a 5 Year Motor Guarantee and 1 Year Guarantee on batteries, solar panels and all electronics. SolarSmart™ can also operate Ziptrak® blinds with a stylish wireless remote control transmitter. This means an easier, more cost effective and environmental way to operate Ziptrak® blinds. For more info pleas contact your local CW Products representative or Ziptrak® direct. Attention all lovers of the colour BLACK! After much demand from many clients, we are pleased to announce that CW Products now offers BLACK as a standard colour for most guides, bottom bars, pelmets and side frames. For product codes and pack sizes, please refer to your new 2011 CW Products Roller Shutter Catalogue. Black is now also available as a standard option for our made-to-measure roller shutters! The new and stylish SIMU Timer Multi 6 Channel handheld remote control allows users to pre-program up to 6 timed commands a day for either individual or grouped channels, and offers complete control and flexibility over rolling blinds, roller shutters and awnings. The beauty of the SIMU Timer Multi is that it's simple to program, even simpler to use and also features an LCD screen! The SIMU Timer Multi also features a twilight function allowing your applications to automatically close a sunset, conserving energy and giving you more privacy. The SIMU Multi Timer is compatible with all SIMU Hz radio motors and transmitters and will be available from CW Products in mid April 2011. We are pleased to announce the opening of our new Sydney office/warehouse! Based in Condell Pk, this new and modern facility will carry increased stock levels & is part of our ongoing commitment to improving overall service to all our NSW clients. We also welcome Joey Balana to the role of Warehouse Manager. Joey brings a wealth of experience and is a welcome addition to the team. We are pleased to announce the launch of our new range of CW Products roller shutter pelmet side frames. Specifically designed to suit our leading range of roller shutter pelmets, these high quality, cast aluminium side frames come with a superior paint finish designed to withstand the harsh Australian climate. Available in 3 of the most popular sizes (165mm, 180mm & 205mm), they come in 4 colours - Cream, Clear Beige, White and Black. Call (08) 8341 0120 for more info. We are pleased to announce the launch of our new Showroom Working Displays for our CW range of high quality roller shutter systems including FireSafe™ and SolarSmart™. 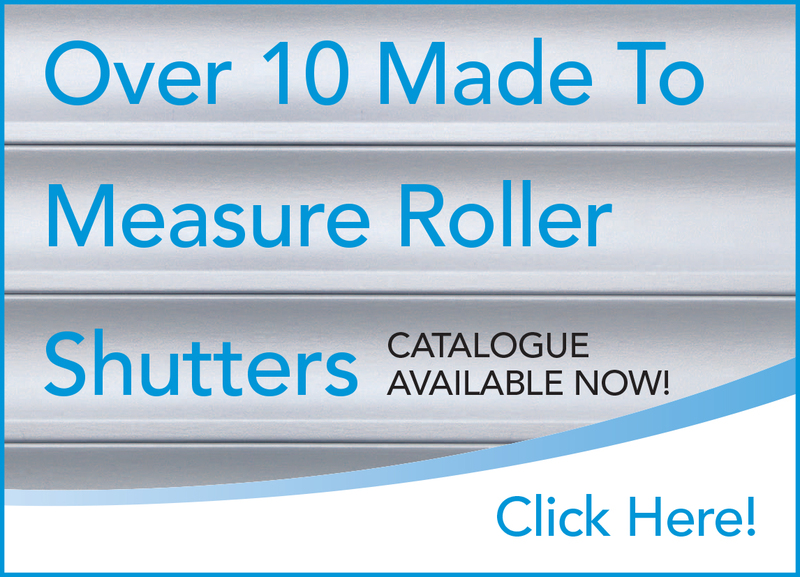 Designed to mount straight onto your showroom wall, the shutters incorporate a promotional insert that highlights all the features of the displayed product. The working displays are quick and easy to install, and are now appearing in retail showrooms nationwide. For more information on how to get your display, call us on (08) 8341 0120. CW Products recently exhibited at the BMAA "Window Covering Expo" on the Gold Coast. The CW team was on hand to launch our two NEW and exciting shutter products in SolarSmart and FireSafe. Our SIMU range of high performance tubular motors and Hz radio technology was also on show. The Expo was a great opportunity for CW to talk directly with you, (the industry), to better understand your needs, and answer your questions. Thank you for visiting our stand and your overwhelming support and positive feedback. At the 2010 BMAA Expo, CW Products in conjunction with SIMU ran a 'WIN $5000' worth of CW Products Roller Shutters or SIMU Home Automation Products Competition on the stand. We are pleased to announce that the lucky winner of this great prize is Greg Wildman from DAAC Holdings from Cleveland, Queensland! Congratulations Greg from the CW Products team! A CW Products innovation, SolarSmart™ is a greener and smarter way to automate your roller shutters! Totally independent of mains power, it harnesses the sun's energy through a specialised solar panel that is positioned on or near the roller shutter pelmet, removing the need for costly installations and electricians. A specialised battery and remote control system is totally integrated into the roller shutter pelmet, making it quick and easy to install. Consider SolarSmart™, an easier, more cost effective, environmental and efficient way to operate roller shutters! CW Products is pleased to announce the national release of its NEW FireSafe™ Bushfire Rated Roller Shutter System. Specifically designed to comply with the new Bushfire Construction Standard AS3959-2009, the system was tested by the CSIRO (Report #FSZ1379) in November 2009 and achieved a Bushfire Attack Level (BAL) of A40 (40kW/m²). FireSafe™ is a fully extruded aluminium heavy-duty roller shutter system that is suitable for large span windows and doors. We are pleased to announce the installation and commission of our new state-of-the-art profile roll forming line at our Murray Bridge factory. The 24 stage, precision roll forming line includes greater quality control features as well as greatly increasing our production output capabilities. The highly automated line is a world first and incorporates an automatic packaging line that wraps the profiles and packs them automatically into our custom made stillages, minimising human handling and helping improve the product quality. Ideal for the motorisation of metal grilles and commercial shutters, this robust and reliable range of central motors has been designed to be of the highest quality. The CENTRIS features a completely redesigned progressive end-limit system with memory rings that require only one cycle to set and confirm end-limit settings. This makes installation quick and easy. The CENTRIS range also comes with an end-limit production box. Featuring an in-built declutching system, the CENTRIS range can be operational in the event of a mains power failure with the use of the ergonomically designed SIMU declutching handle (sold separately), ensuring your door is always operational. The CENTRIS is available in 100Nm and 200Nm versions.